I love variety. I get tired of looking at the same thingsall the time. I like to change things up once in awhile. I like contrast, new things, visual changes in my house. 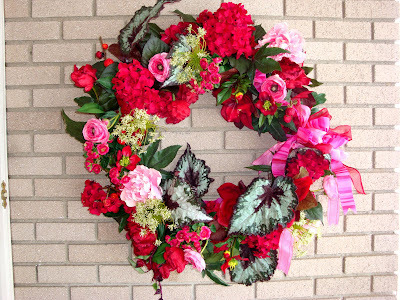 Today is the last day of February, so it's time to change up the wreath by the front door. This is my February wreath because of it's Valentine colors. Sadly (for Craig), I have a different wreath for every month of the year. So, tomorrow I will be putting up my March wreath. This makes me happy. 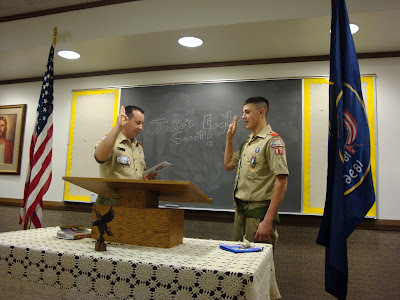 Doesn't Jake look awesome taking the Eagle Scout Oath?! 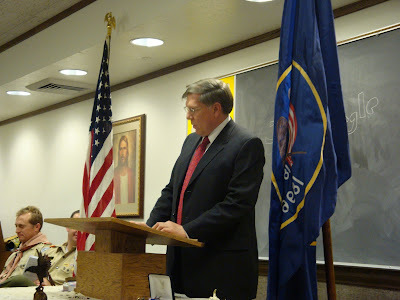 We had a great evening Sunday honoring Jake's accomplishments in scouting. 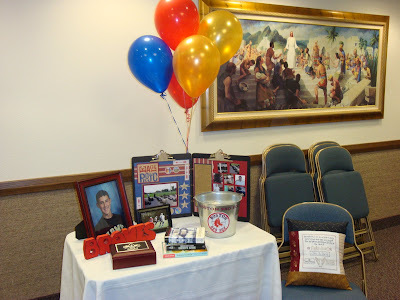 Many people attended and participated who love Jake and have had a great influence on him. I'm so proud to have two "Eagle Scout Mom" pins. 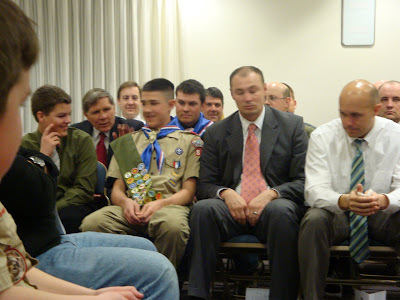 The best part was hearing Sam talk about how excited he is to join his brothers, dad, grandpa, and uncles in the Eagle's Nest. 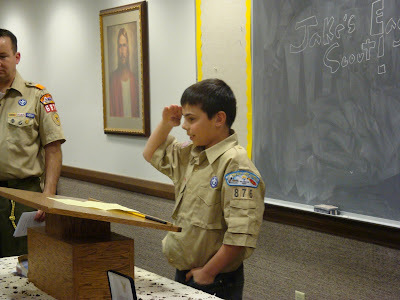 Thanks for being a great example Jake! Jake celebrated his 15th birthday yesterday. I can hardly believe we've known him that long. We went to dinner at Rio Grande Cafe where Jake opened a few family presents. 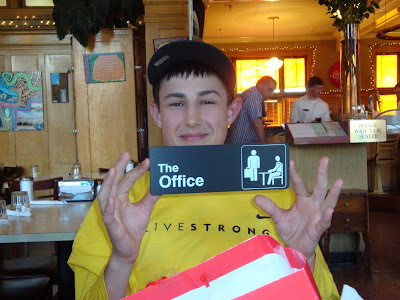 Caroline bought him an "Office" door plaque. 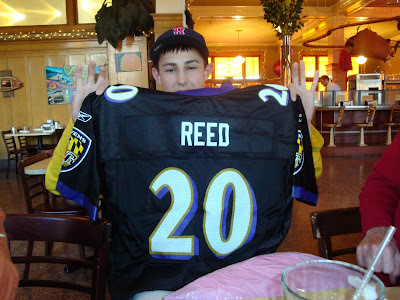 Craig and I got Jake an Ed Reed Baltimore Ravens football jersey (I don't even like the Ravens). He also recently got a new phone and needs new skis. On Jake's birthday, I want him to know that he is a joy to raise. All this, and good at baseball too! We love you Jake! Happy Birthday. This is Isaac Craig Parry (aka Icky). We decided he should be the picture of the day last Thursday for this reason: On the way home from school, Isaac said to me, "I wish we could have a special day at school where I could say all the mean things I could think of to people in my class. I think I could make at least six people cry." It was rude, but a little funny. I don't always understand the way his brain works. These pictures of his face were taken while he was cooking up some of his "mean comments". The foot he is kissing is Jake's size 14! We had a wonderful Family Night this week. 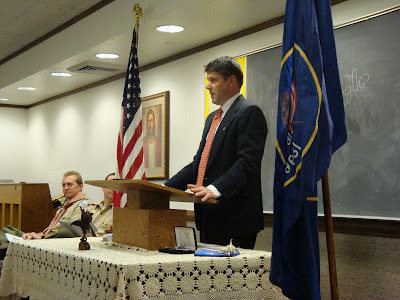 We attended the open house of the new Draper, Utah temple. I was amazed and happy about the reverence with which my kids approached the tour. They asked many appropriate questions and were clearly happy to be there. The temple was beautiful. We particularly liked the baptismal font and I enjoyed the flower motif that was repeated throughout the temple on ceilings, walls, glass and even carpet. I think the flower was a lily. 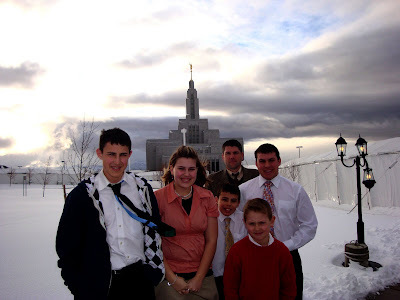 Temples are always a good reminder that families are forever and this week is the ninth anniversary of my dad's death, so it was particularly a good reminder for me. I have become a good world shopper! 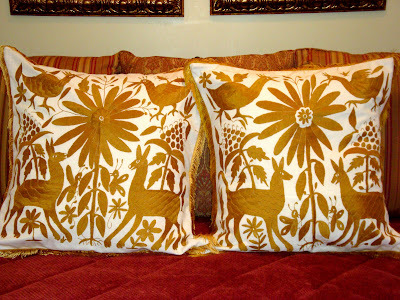 I bought these stitched table-toppers or wall hangings (or whatever they were) in Ghadalajara then turned them into pillows for my bed. This yellow color is my second favorite color in the world. Every time I walk into my room and look at the bed these make me happy! We had a more exciting week than usual! Isaac went skiing last weekend with Craig and came home with a little cough. By Sunday, he had progressed to coughing and wheezing so we skipped church and went to KidsCare. They gave him a breathing treatment and sent him home on steroids. I thought that would be the end of it, but when our Super Bowl party ended, he looked grey and was really wheezing so we took a trip up to Primary Children's Hospital. After a "super-neb", which is a bionic 45-minute breathing treatment, he was worse again, so after "negotiating" (probably a better word is fighting) with the attending physician in the ER, they finally admitted Isaac at 4:00 a.m. and watched him through the night. They had to give him two more breathing treatments and turn his oxygen on for awhile, but by morning he seemed to have turned a corner and we went home in the middle of the day. I took Isaac to Dr. Briesacher's Tuesday for a breathing check. . . still wheezing. . . So now he is taking antibiotics for pneumonia. Whew! It's been a long, taxing week. Isaac went to school Thursday, but it wore him out so much he couldn't return on Friday. Hopefully the weekend will be long enough for him to rest and be better for Monday. We are going to St. George for President's Day and I know that will really help him to breath cleaner, warmer air. The health adventures of raising Icky. . . (stay tuned for more episodes).